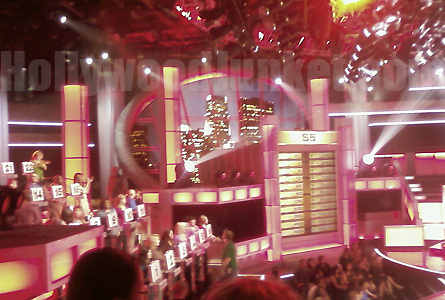 DEAL OR NO DEAL (Daytime): Second Week of Filming! If you’re a fan of the show, and ever wondered what it would be like to stand in the models’ places, you may have your chance! daytime, some changes have been made to make it a bit lighter and quicker. The first being, MODELS! Viewers will not hear a 26 unified “Hi Howie”, but, only two ladies, Patricia Kara (#9), and Tameka Jacobs (#21) uphold the traditional host greeting. Howie still hosts the show in full suit. In place of the gorgeous models are some real, non-camera shy folks picked as potential contestants. Only 22 cases and contestants are in play. 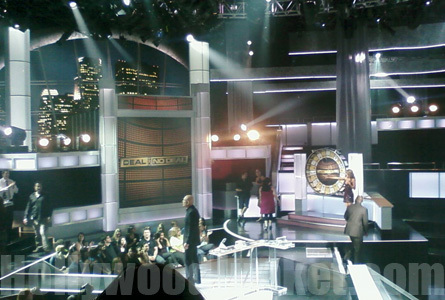 A gold ball is dropped into a glass-enclosed “Deal Wheel” by Tameka while Patricia spins the wheel. Whatever number the ball falls on, correlates to the number of case/contestant is called down to play the game. Each person called down, does not have the benefit of having friends and family in attendance for moral support. 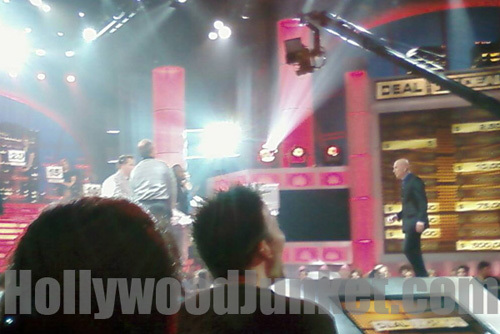 Howie entering stage for new show taping. Tameka and Patricia take their places on both sides of the stage with contestants and are in charge of collecting the cases chosen and handing them off to production staff backstage. It’s very Vana White-like, but instead of turning numbers, they’re picking-up cases. The case count is 5-5-4-2-2-1-1 with the two remaining cases left, one of which is the one the contestant either was given a the beginning of the show, or decided to trade out for another one. If a contestant choses to switch his or her case, their old case is given to the contestant he or she is switching with. Contestants take the stage where models stand during the prime time show. The stakes are a lot lower. The highest number on the board on the left is, $500. Highest numbers on the right are: $50,000, $75,000, $100,000, $250,00, and $500,00. Only half a million can be won on daytime. Money offered by the Banker seems to be contingent on how well he likes the contestant. If you’re ever on the game, you better hope he likes you because it can be a big factor on how much you walk away with. Audience video reviews will be available soon!